The three-field system was a regime of medieval crop rotation beginning around the 9th century and was the practice of growing a series of different types of crops in the same area in sequential seasons. With this system, the arable land of an estate or village was divided into three large fields: one being planted in the autumn with winter wheat or rye; the second planted with different crops such as peas, lentils, or beans; and the third was left fallow to allow the soil of that field to regain its nutrients. With each rotation, the field would be used differently, so that a field would be planted for two out of the three years used, whilst one year it "rested". This allowed for more crops and therefore an increase in productivity. The Domesday Survey of 1086 indicated land at Yeovil "sufficient for three ploughs". At this time East Field would have been one large, open field but gradually it became divided and sub-divided over time and ultimately became a patchwork of fields within the boundaries of the original. 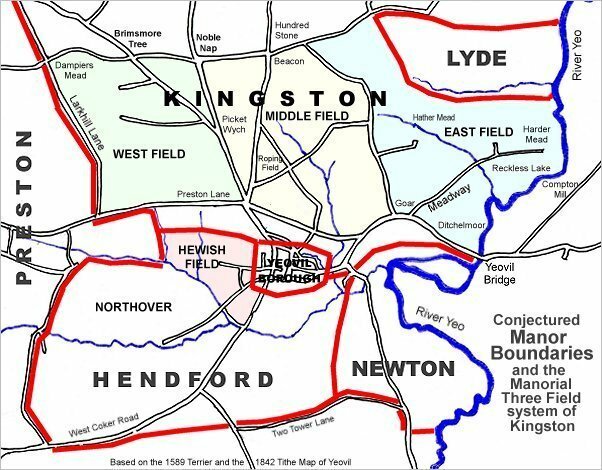 The area occupied by East Field, in terms of today's geography, was (very roughly) bounded by St Michael's Avenue in the west, St John's Road in the north, the River Yeo in the east and Sherborne Road in the south. The Montacute Cartulary, a thirteenth century charter of Simon Lovel makes reference to "that half-acre of land in the east field of Gyvele in the tilled land called Langelonde which lies between the land of Ralph Roe, and the land of Robert de Suthyorne...."
A deed from Up Mudford, dated 20 May 1631, refers to ".... 6 a(cres) of arable in Eastfield and Southfield...." and another deed, dated 7 October 1651, ".... in Eastfield 2½ a(cres) in the Lower Furlong...."
The 1589 Terrier indicates the three great fields - west, middle and east - as shown on the map below, "Eastfields from Meadway Gate the lower part of the way, unto Reckless gate and from thence to the great river and up to Yeo. Bridge being Ditchelmore.... from Reckless Lake in the outpart of the Meadway (the southern part of today's Lyde Road) unto the river before Compton Mill bounding upon the lands of the Lord Sturton in the north part right before the Meadway by the river towards Yeo. Bridge and upwards to the lower part of the Harde Mead and from thence upward between the lands of Thos. Phelps the east side of the lands of Francis Beacham on the west side to the bounding of Stonylake and from Stonylake down by Lidegurl to the great River and so upwards from the grate river to Compton Mill aforesaid being the rest of the Down and Harder Mead Hill bounding upon Lide.... Yeovil's East Field from Stone lake between the lands of Thos. Phelps and Francis Beacham aforesaid upward to Lidegate and from thence to the lower end of Swincombe and up to the Beacon and so down Longdown bush by the Lane to the lower end of Hardermead.... East Field from the upper part of harder Mead down to the corner of Gore and in the Eastfield to Reckless Lake and to the upper part of Harder Mead...."
The 1842 Tithe Map indicates the East Field to the north-west of Little Lyde Farm and the 1846 Tithe Award notes parcel 967 as East Field, Arable ".... though of miniscule proportion in relation to the great open field of the time of Domesday." 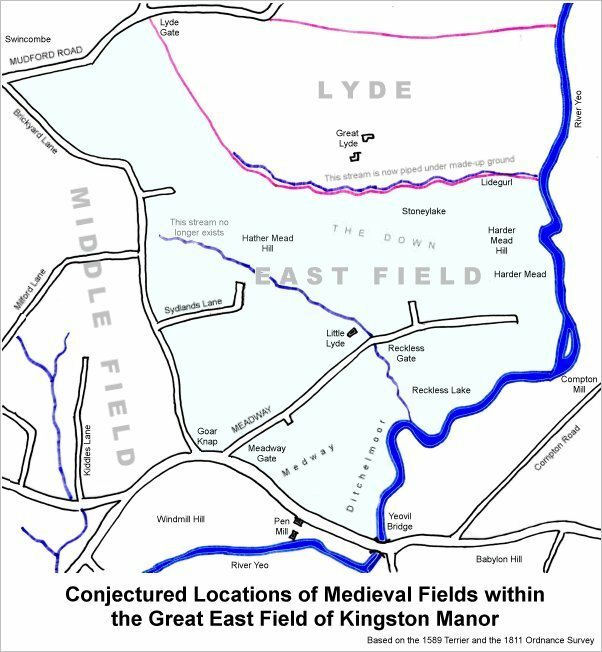 A map of the great Medieval East Field of Kingston Manor showing conjectured locations of several fields based on descriptions in the 1589 Terrier.